After this last 16-18″ snowfall, as with every snowstorm, The Heartbeat of Haverhill is forced from our warm home and heavily ‘powdered’ parking lot into the icy cold for an hour or so while the lot is plowed. This is usually in the morning, robbing me of the option to sleep in after a work canceling storm. Every time I seek out reasons to be happy for this season. THOH usually finds it, despite grumbled protestations that of the four New England seasons, Winter is my 5th favorite. Eventually by the time I return to my plowed out yard and shoveled, sanded, and salted walkway, I am almost always smiling. grateful, and hoping to share the beauty, and even humor. Yes it is tough walking about or finding parking or keeping track of both gloves, but we have helpers here in the City who plow and shovel and provide shelter as needed. And I am very thankful for them. Citizens and employees who put the effort forward to do a good job to make the City safe. Sure it may not happen instantaneously on every street, but they are out there working round the clock. In fact by 8 am the day after this storm the major roads were cleaned down to the pavement, and easily passable. Smaller side streets do take longer. The efforts of the workers made it possible for me to explore. I checked out some of our iconic buildings and structures…. Haverhill City Christmas Tree in Washington Sq may have gotten a reprieve due to the blizzard. THOH GOT A CHUCKLE FROM THESE IMAGES….. The Tap is using a snow blower to clear off its deck, in case someone wants to sit outside. I just love Haverhill. It’s my home for over 21 years. Those are some lovely photos. Been here just over 40 years. 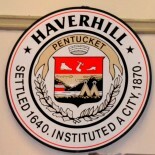 Haverhill offers a nice blend of city & country benefits. This entry was posted on January 6, 2018 by Brain4Rent/THoH in Haverhill Blizzard 2018, Haverhill in Winter, Snow, Uncategorized and tagged Basiliere Bridge, Comeau Bridge, Dustin Garrison House, Haverhill Water St Fire Station, Kazmeira Marina, Lake Saltonstall aka Plugs Pond, Merrimack River, Nature, New england Winter, photography, Plugs Pond, Swasey Field, Swasey Field Sledding, Tattersall Farm, The Heartbeat of Haverhill, The Tap Haverhill, The Thinker at Haverhill High School, THOH Brain4Rent, Walnut Sq School, Washington Sq Christmas Tree, Washington St, Wingate St, Winnekenni.